Over the past few months I have noticed more and more campaigns against the use of plastic bags both locally and internationally. I think this is great. A few years back South Africa stopped giving plastic bags out for free and we now have to pay 46c for one. The change that this brought was huge. For one, litter visibly reduced by what I would confidently say, at least 50% and we started looking for alternatives to carry our grocery’s and shopping in. 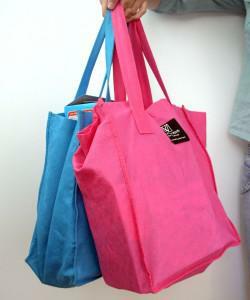 These alternatives quickly emerged in the form of cheap fabric bags which has started a whole move on it’s own. Woolworths (one of South Africa’s leading brands and food and clothing stores) introduced what we now refer to as the ‘Woolies bags’. I think everybody must have at least two. I think at one stage they were given away for free but now you buy them which is fine becuase the colours are bright and fun and the purpose basic. This was a great branding opportunity for Woolworths and others big brands soon caught on. Sometimes I wish it was not all a branding competition but when the bigger picture is positive, I guess I should not criticise. There has been another option that I cannot leave out of this post: the big red and blue thick plastic bags that zip closed. 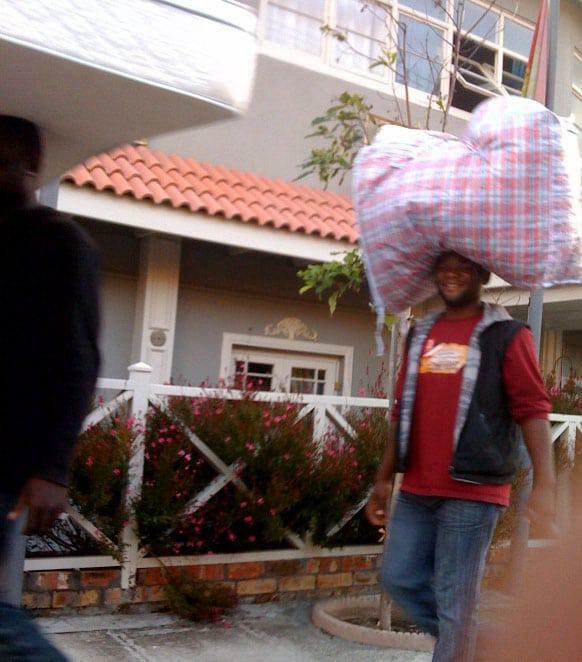 These bags have been around for ages and are most often seen on long taxi journeys (used as luggage bags) or for carrying grocery’s on top of heads. They are SO cheap (R15 which equates to about $1.50) which is another reason why they are so popular. I have two which I use to transport my fabric and bags around in. The picture below was taken with Jeremy’s cellphone the other morning. The man was carrying one of these plastic bags on his head whilst his friends were carrying a mattress of theirs. It is surprising how many countries still have not caught onto how easy it is to cut litter by simply stopping free plastic bags. This entry was posted in Blog and tagged african red and blue plastic bags, ban plastic bags, Fabric, litter, plastic, Plastic Bags, shopping bags, stop litter, woolworths. Great and true post,Wendren!Here we have the problems with the plastic bags.ItÂ´s always good to have a alternative!Have a nice daY! I’ve got a green Woolie bag ;) and a red shoprite one…. Yes, the U.S has this problem. Thankfully, they are allowing recycling options, but it’s still wasteful. I think the Rue-Me bags are a good option, or any kind of bag that you can use to put groceries in that will be re-usable again is good. That plaid bag is huge on that man’s head, though! I don’t think I could carry that one. The red and blue check bags do come in various sizes but the big size is the most used. We carry everything in them and a child I remember traveling from Botswana to South Africa packing all my clothes into them. The Border Post is also full of these bags – everybody uses them. I might be mistaken but I seem to remember that for one of Paul Smith’s fashion ranges he made a bag inspired by these plastic red and blue bags. Such a great post, love the photo of bag on a head. We have the same checked bags here…but we are behind on supermarkets and shops, they give out bags too much! I wish they would stop and make a big difference.